When you are pregnant, it's natural to want the best for your child. It's definitely true that we put far more effort into researching products for our baby than we do for ourselves! So we were no different when it came to finding skin care for our baby. Babies are so soft and new, and the idea of using some of the harsh, chemical laden products we had seen in the shops filled us with concern. We both try to lead as eco friendly a life as possible - vegan/vegetarian diets, recycling as much as we can, and favouring natural, cruelty free products, so we wanted this to be no different for our baby - having decided on using cloth nappies and wipes for our son, we set about the task of finding skin care for him. Research told us we needed something as natural as possible, with no parabens or sulphates. We also wanted it to be cruelty free, and vegan was a plus point. So it was surprising to us how many brands use buzz words like 'natural' 'pure' 'organic' to describe baby toiletries that, upon checking the label, we found weren't quite fitting that description! 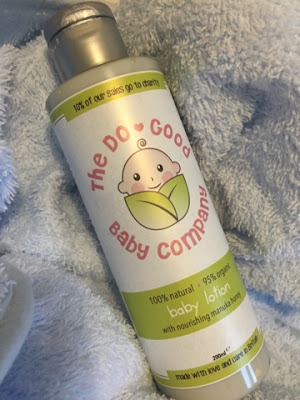 The Do Good Baby Company was a brand we spotted at The Baby Show this year at Birmingham NEC. They very much seemed to offer a lot of what we were looking for, but it was nearing the end of the day, the sales person was busy with another customer, and we had a pram to collect! So we put it on our list of brands to check out later. We were thrilled when the company sent us some of their products for review, and after researching the brand, they seem to tick every one of our boxes and more! Why was The Do-Good Baby Company created? 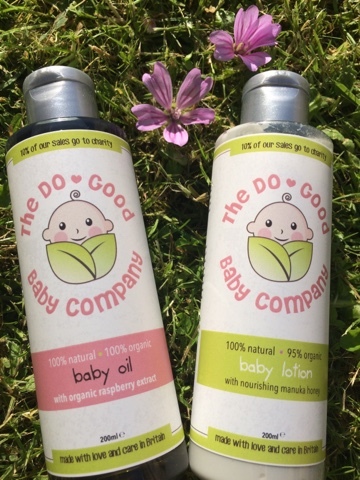 "The Do-Good Baby Company was started to fulfil a clear gap in the market for a premium quality skincare range that uses only the finest natural and organic ingredients opposed to cheap artificial ‘bulkers’ and ‘fillers’. All our products are completely natural, using plant-based emulsifiers and oils to keep your baby’s sensitive and delicate skin soft, smooth, and hydrated all day long." What about babies with really sensitive skin? "Babies are much more prone to rashes and skin conditions such as eczema, psoriasis, and dermatitis - so all of our products have been designed with these skin conditions in mind, making them suitable for even the most sensitive of skin! Parents whose children suffer from eczema and have tried our products can vouch that they work - we don’t use any of the harsh chemicals present in some medicated washes and creams, but instead simply aim to use the finest quality ingredients to moisturise the skin and stop flare-ups with natural plant oils and extracts. " Why is natural skin care so important for babies - why can't they just use the same products we do? "All our products are completely free of parabens, sulphates, SLS and harsh, artificial chemicals which absorbed into your baby’s skin. During infancy, because the skin is so thin, a baby will absorb up to twice as much of what is put on his or his skin, compared to us as adults. We wouldn’t feed our baby something that was produced in a lab - so why put something on their skin that was produced in a lab? It all ends up in their bloodstream! You will also notice that by using natural products you need far less than you would a cheaper “supermarket” product - a little goes a long way! It sounds cliché, but what really sets us apart from similar products on the market is the quality of ours. Because of the ingredients that go into our products, it’s very easy to see a difference to your baby’s skin a very short period of time." We love the cute logo - is the packaging eco friendly too? "We strongly believe that businesses today have a responsibility to protect the planet and to help those in need. It’s ironic how the biggest baby product brands in the world are actually making the world a much worse place for their customers’ children to grow up in. We wanted to change this, and it was the main reason I left the corporate world to pursue this gap in the market. Natural is best - not only for our skin, but also for the planet - the natural make-up of all our products mean they are completely biodegradable so cause no harm to the planet when washed down the drain. All our bottles are made from 100% recycled plastic and are un-bleached - so less waste goes to landfill, and less natural resources are needed to make new bottles. You may notice our bottles have a slight blue/grey tint to them - this is completely normal with recycled plastics, and we believe it is symbolic of our dedication to protecting the planet for the next generation." Apart from being mostly vegan and organic, and completely natural and cruelty free, are their any other benefits to using your products? "We pledge to donate 10% of our company sales to charity - it’s the key principle of our ‘do-good philosophy, and it always will be. Come November, when our annual accounts or produced, 10% of the sales figure will be donated to charities that aim to better the lives of babies and children around the world. We chose to base of charitable giving on sales, opposed to profits, as a guarantee to your customers that every time they make a purchase, they’re making someone else’s life a lot better at the same time." What age should oils/lotions/washes be used at? "If a product is 100% natural it would be suitable from birth, but because a baby's skin is so delicate in the first few weeks, we just recommend using oil and you can use lotion for any dry patches that develop - there really isn't any need to use other 'soap' products, so we don't advertise that people should." The first product we used was the Baby Oil. It is 100% natural, vegan, cruelty free, and 100% organic - we couldn't ask for more! It contains no parabens, sulphates or SLS, but does contain organic raspberry extract, grape seed oil, and chamomile. 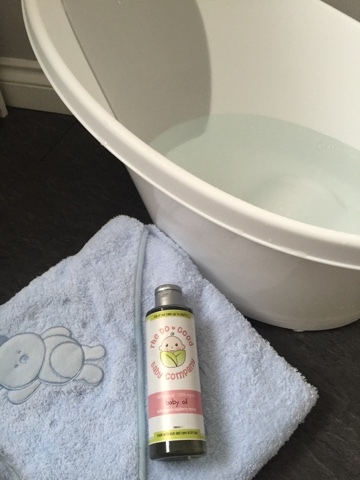 We were advised to add a little to Oskar's bath water - this instantly 'softened' the water, making it moisturising on Oskar's skin as opposed to drying it out, which baths sometimes can. Oskar certainly seemed to enjoy himself! Adding the oil to his bath wasn't something we had considered before but was certainly a great idea! 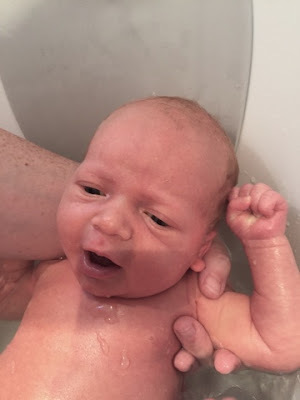 Sometimes Oskar really enjoys baths, and is happy for us to apply oil to his skin as a moisturiser afterwards, or for us to give him a longer baby massage before bed. However, on occasions Oskar is less fond of the bath, and is then less willing to patiently allow us to moisturise his skin! The oil in the bath water was perfect for this, it saves time and hassle as when we got him out of the bath, he was super soft! We only added a very small amount, but this went a long way as the oil disperses in the water. We used the oil as a moisturiser the next day and really liked it for this purpose too - despite making Oskars skin feel soft and nourished, it sank in quickly - we didn't want him to feel greasy! The second product we tried was the Baby Lotion, which is 100% natural, cruelty free, 95% organic, and contains manuka honey and coconut oil. Again it contains no SLS, parabens or sulphates, and it can also be used as a make up remover for mums! After Oskars bath we applied a little bit of the lotion to his hands, feet, arms, and knees, as he often gets dry patches here. The lotion is very light, and feels very gentle on the skin, but worked well at softening the little flaky patches newborns are prone too. Overall, we were thrilled with the items - the fact that they are 100% natural and cruelty free, mostly vegan and organic, and come in biodegradable recycled packaging is amazing, not to mention that the company donates 10% of profits to charity. It's a lovely feeling to know the products are so eco friendly! And most importantly, we really enjoyed using the oil and the lotion - its great not to have to worry that what you are putting onto your baby's skin could be irritating them, especially as we used the products on Oskars hands - which are often in his mouth! 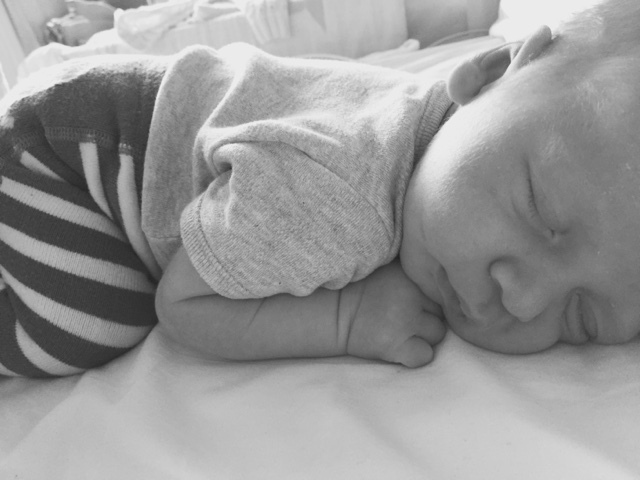 The fact that the products work so well is great as we didn't have to use much, and therefore didn't feel we were covering our baby in products. We also liked the fact that the products are fragrance free - although some people like strong scented baby products, we much prefer that fresh new baby smell! The range of four products also include a shampoo and a body wash, that we're sure we'll be trying out when Oskar is a little older. You can purchase products from The Do-Good Baby Company here - and shipping is just £1. Their site also has really informative blog posts, and you can follow them on Twitter at @dogoodbaby.